In microscopy, pixel size often exceeds the size of the focal spot of the excitation beam. This means, higher fluorescence intensities can be acquired without losing resolution if the whole area of a pixel is excited. The LaVision BioTec 4x Cloud Scanner separates the single excitation beam both spatially and temporarily into 4 beams which excite the whole pixel area. The 4X Cloud Scanner is fully integrated into the TriM Scope II Scan Head and the LaVision BioTec ImSpector microscopy software. 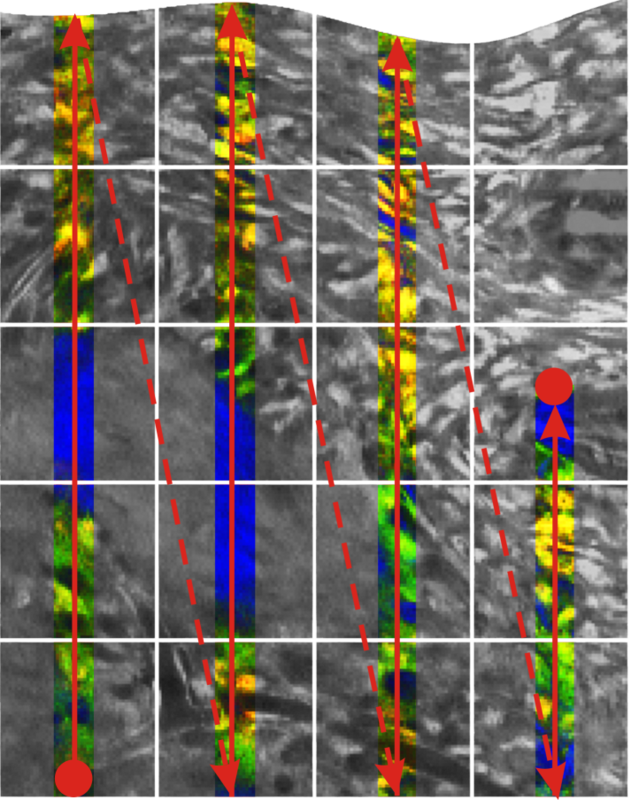 Each TriM Scope II including a 4X Cloud Scanner can be switched between single beam or Cloud Scanning mode by a single click in the ImSpector microscopy software. In standard single beam mode, the Cloud Scanner beam multiplexer is bypassed and in Cloud Scanning mode the excitation beam goes through the 4X Mini Cloud Scanner. Many intravital 2-photon microscopy applications require the highest frame rates without highest resolution to deliver relevant information with respect to dynamic events (e.g. calcium imaging). Under those imaging conditions the pixel size (1 to 2 µm) is much larger than the diffraction limited focus diameter (< 400 nm). Thus, only a fraction of the fluorophores within a single pixel will be excited by the single laser focus. 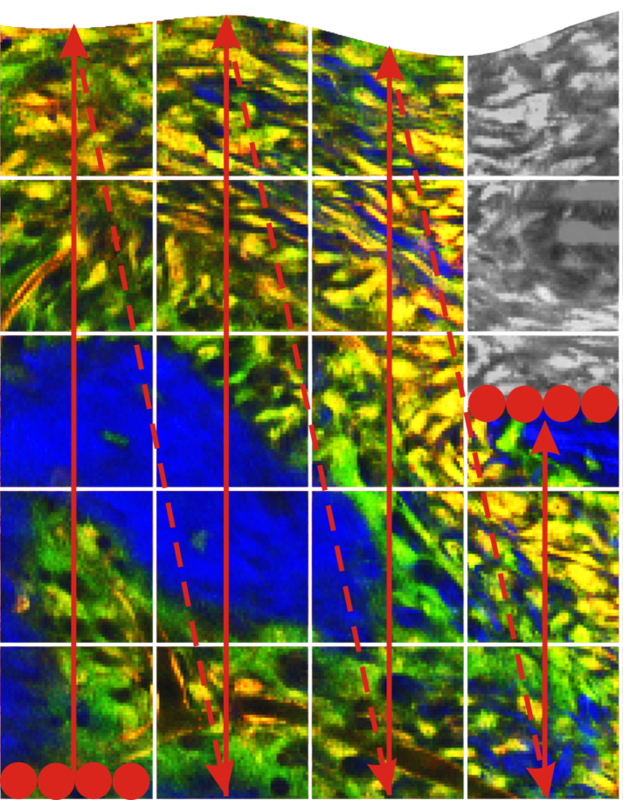 Cloud scanning overcomes this drawback by generating a line pattern of 4 foci (< 2 µm @ 20x objective lens) which will excite all fluorophores within the pixel. Comparable to the 4X Cloud Scanner, the eight beams can be also arranged in a way that fills a complete pixel. All fluorophores will be excited at once within a pixel and the imaging speed is increased. The Cloud Scanner is an add-on for the modular TriM Scope II that is mounted to the backside of the scan head. By pushing a slider, the user can choose if the beam bypasses the Cloud Scanner or goes through it. The beam arrangement is software controlled and can be optimized during the measurement. Microscopy of dynamic events always depends on signal to noise ratio and therefore on the fluorescence intensity. In turn the fluorescence intensity depends on the fluorophore, the excitation power, and the exited area. If it comes to in vivo calcium imaging of somata the fluorophore is given and the maximum excitation power is limited because of photo-bleaching. 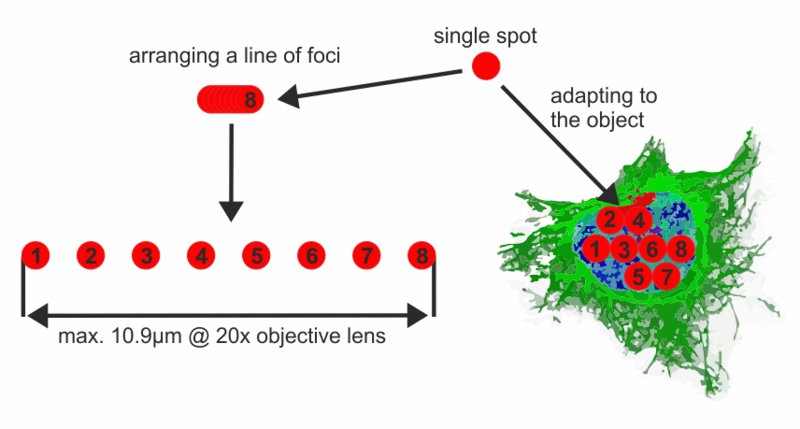 Exciting the cell body by scanning its entire area increases the fluorescence yield. The Cloud Scanner excites this necessarily larger area at once. It allows defining a pattern of eight diffraction limited foci filling the structure of interest. Therefore the individual soma does not have to be scanned anymore and could be excited at once. Cloud scanning can be applied to all scanning patterns including raster scan, line scan, and point measurements. Increasing the fluorescence signal leads to better results and allows faster imaging. Moreover, the photodamage is reduced because of the spatial beam multiplexing. If the beams are also temporal multiplexed, the photodamage is further reduced. 200ps delay between two foci eliminates cross talk and allows to increase the laser power without damaging the sample. Time delay between laser pulses while using a utilizing a 80 MHz Ti:Sa laser. Scanning and data acquisition remain identical to a standard single beam laser - scanning microscope – but it gains brightness. Since speed depends on brightness, the maximum frame rate can be increased substantially. 8X Cloud Scanner integrated into the TriM Scope II Scan Head. 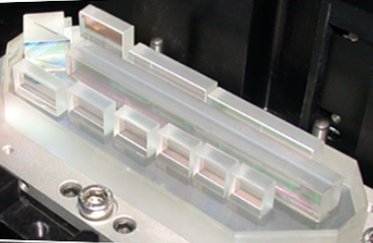 The 64 Beam Option is the best choice for high frame rate applications like calcium imaging in brain slices. Therefore, the excitation beam is divided into 64 individual beamlets. These are scanned simultaneously over the sample. The fluorescence signal is then detected by a fast sCMOS CCD or EM-CCD camera. Depending on the camera type, this setup delivers up to 100 frames/sec @ 2560x2160 pixel resolution. These frame rates allow the detection of calcium signals in brain slices and the observation of activities in neuronal networks. 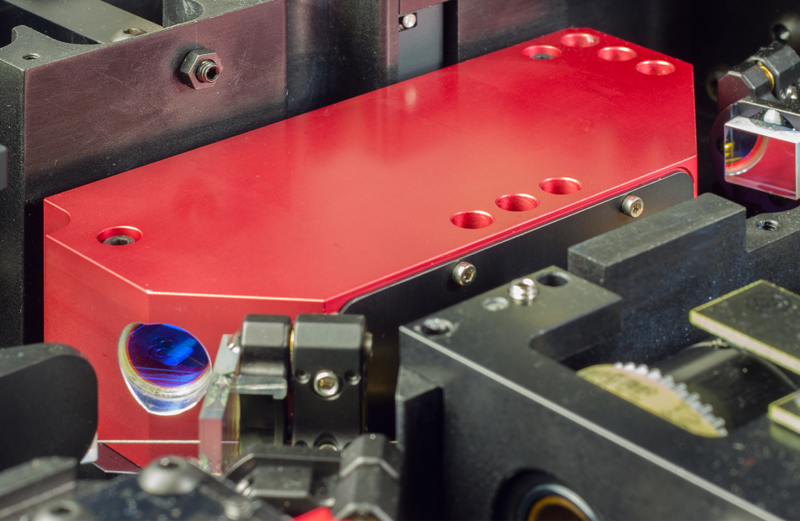 The 64 beam splitter is mounted in the scan head of the TriM Scope II microscope. The switch between single-beam and multi-beam mode is motorized in such a way that the user can select the best imaging option: with a single-beam and the resonant scanner for fast imaging deep in a tissue like a mice brain and with 64 beams for fast imaging in brain slices. The choice of the beam number then determines the type of detection: with a camera for 64 beams and with PMTs for a single beam which are both mounted to the TriM Scope II. The monolithic beam splitter of the 64 Beam Option.